an the surrounding area. Some Ancient Indian tree deities, such as Puliyidaivalaiyamman, the Tamil deity of the tamarind tree, or Kadambariyamman, associated with the kadamba tree were seen as manifestations of a goddess who offers her blessings by giving fruits in abundance. Tree worship (dendrolatry) refers to the tendency of many societies throughout history to worship or otherwise mythologize trees. Trees have played an important role in many of the world's mythologies and religions, and have been given deep and sacred meanings throughout the ages. Human beings, observing the growth and death of trees, the elasticity of their branches, the sensitivity and the annual decay and revival of their foliage, see them as powerful symbols of growth, decay and resurrection. The most ancient cross-cultural symbolic representation of the universe's construction is the world tree. The image of the Tree of life is also a favourite in many mythologies. 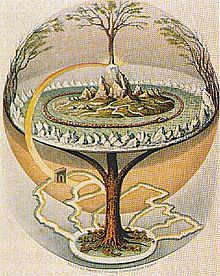 Various forms of trees of life also appear in folklore, culture and fiction, often relating to immortality or fertility. These often hold cultural and religious significance to the peoples for whom they appear. For them, it may also strongly be connected with the motif of the world tree. Other examples of trees featured in mythology are the Banyan and the Peepal (Ficus religiosa) trees in Hinduism, and the modern tradition of the Christmas Tree in Germanic mythology, the Tree of Knowledge of Judaism and Christianity, and the Bodhi tree in Buddhism. In folk religion and folklore, trees are often said to be the homes of tree spirits. Historical Druidism as well as Germanic paganism appear to have involved cultic practice in sacred groves, especially the oak. The term druid itself possibly derives from the Celtic word for oak. Trees are a necessary attribute of the archetypical locus amoenus in all cultures. Already the Egyptian Book of the Dead mentions sycomores as part of the scenery where the soul of the deceased finds blissful repose. The evidence for tree-worship is almost unmanageably large, and since comparative studies do not as yet permit a concise and conclusive synopsis of the subject, this article will confine itself to some of the more prominent characteristics.